Charity game tickets are commonly referred to as a break-opens or pull-tabs. When your organization sells charity game tickets, it is selling integrity. Each ticket indicates total tickets per game and number of prizes. Every deal contains all tickets and all prizes indicated on the ticket. Player prizes are below the taxable amount. Tools allow your organization to easily account for ticket proceeds. Ticket proceeds benefit your local community. Charity game tickets can be purchased from any licensed supplier that sells charity game tickets. The following is a list of all charity game tickets available. If your organization has not yet held a gaming license, you must first qualify before any license will be issued. Qualification documents may be submitted along with the license application and payment for your license. Charity game tickets are primarily sold at bingo (under a bingo license) or during business hours at fraternal and veteran clubs (under an annual charity game ticket license). Charity game tickets may also be sold under the Special Bingo, Special Charity Game, or Raffle license. Annual Charity Game Ticket License - This license allows an organization to sell charity game tickets at their club. This license is issued for one calendar year and may be renewed annually. The license fee is $200. 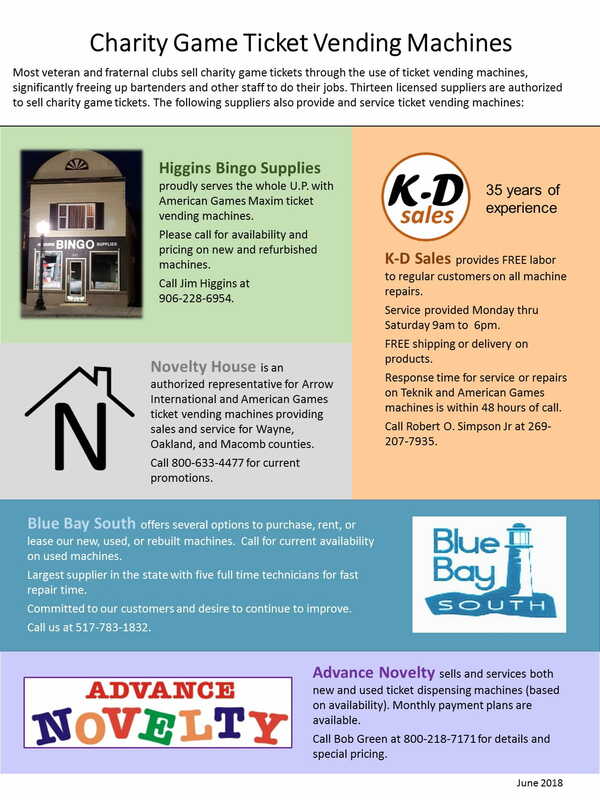 For those wishing to purchase or lease a ticket vending machine, see the supplier promotion for Charity Game Ticket Vending Machines. Special Charity Game Ticket License - This license allows an organization to sell charity game tickets for up to 4 consecutive days. An organization can receive up to 8 special charity game ticket licenses per calendar year. The license fee is $15 per day. Viewing of the four videos is mandatory for the Principal Officer, all Chairpersons and all record keepers. These videos provide officers, chairpersons, and other workers with the responsibilities, rules, and completion of game records for charity game tickets. When prompted, sign in to the quizzing feature. This can also be used as a refresher tool, with or without quizzing. The Annual Charity Game Ticket License Application and the Annual Charity Game Ticket License Renewal Application require certification from the Principal Officer that they, all Chairpersons, and all record keepers associated with the license, will view and understand the information contained in the training videos, and will contact their local inspector with any questions. No license will be issued without this certification.